We kindly ask you to use public transport. For all materials in use as well as for the catering conservation of resources, the protection of the environment and sustainability are top priorities. Food originates from regional and organic production and fair trade respectively. Also give-aways fulfil the sustainability standards. In order to avoid waste, drinks and meals will be served solely in and on reusable dishes. Leftovers can be taken home in the “Tafelbox”. For each box 20 cent go to the Austrian Tafeln, a charity organization, which serves impoverished people with saved food. It is especially important to us that participants can travel to and from the venue in an environmentally friendly manner. 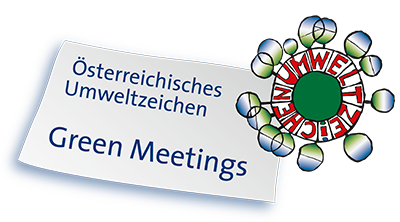 The venue, Hofburg, is located centrally and can be conveniently reached by public transport (for more on transportation, also see above). There is sufficient space to park bicycles around the venue. Furthermore, there is also a city-bike station as well as e-charging stations (for example, in the garage on Robert-Stolzplatz).